Here’s one straight from Granny’s decorating tool box: Sink skirts. 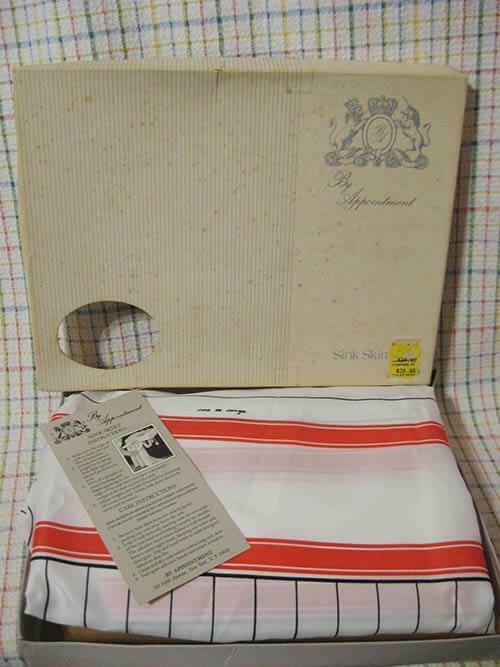 You don’t see these much anymore, so we were excited to spot this NOS Vintage Bathroom Sink Skirt in white, black and red for sale on Ebay from seller picnic21. That’s right — this vintage sink skirt — designed by Jane de Jonge and marketed by “By Appointment”, with a Fifth Avenue New York City address — looks fresh from its 1950s? 1960s? 1970s? 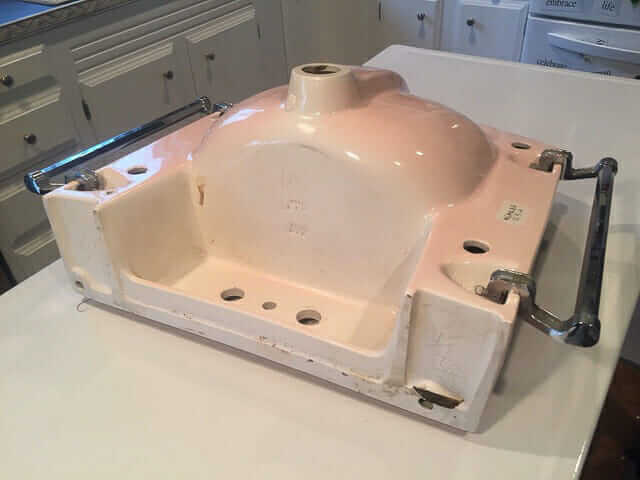 factory — still in its original box with instructions and price tag. New Old Stock, box shows lots of wear…1970’s(?) 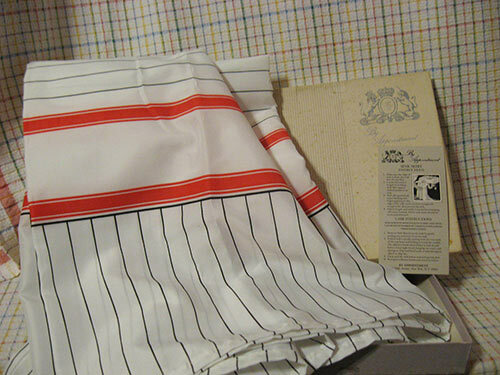 any info welcomed…couldn’t find anything on this company name By Appointment or designer name on skirt Jane de Jonge……care instructions included…Fabric Excelon-vinyl….31 1/2″ long x 54″ wide…band is 2 1/4″ thick. 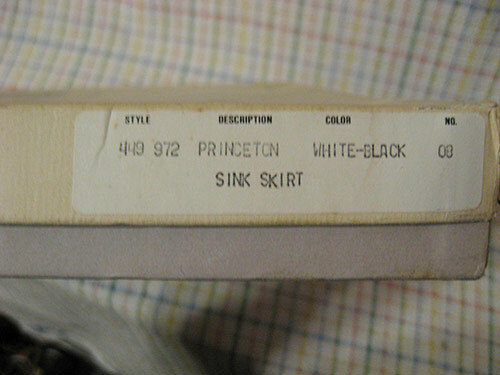 White, red and black… designer name appears 4 times around skirt. 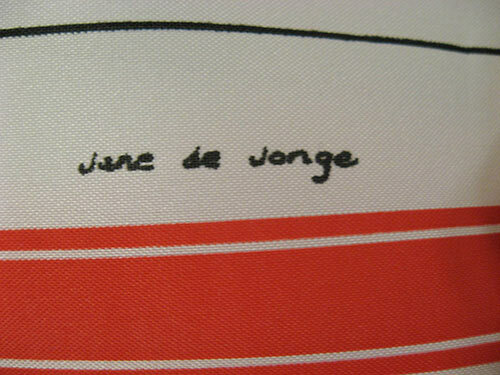 I’ve never heard of Jane de Jonge — have you? A quick internet search came up with no leads. 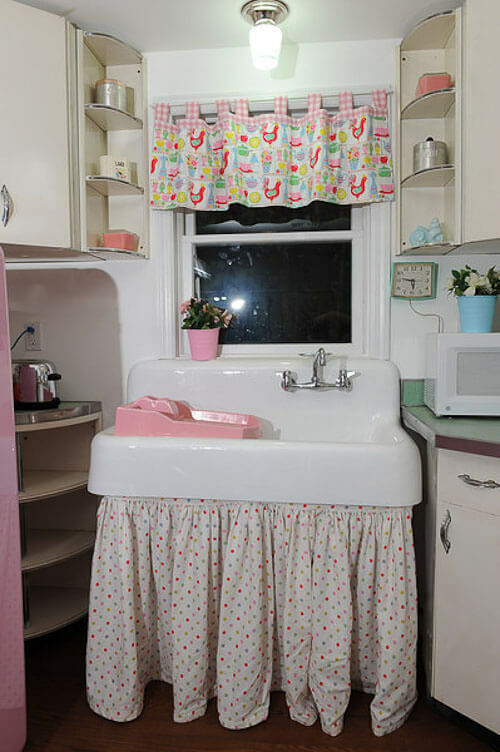 This sink skirt is simple and classic — in great vintage colors. This sink skirt would look great on a white, yellow, pink, blue, green — heck nearly any pastel vintage sink. 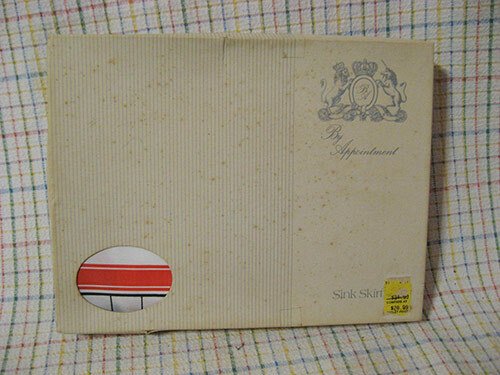 It is always neat to see vintage goods in their original packaging. The sink skirt attaches to the sink with an adhesive strip — all the sink skirts I’ve come across before have been held up by elastic or ties — does this make it a woddity? The adhesive must be reusable since the care instructions say to fold the adhesive into itself for washing and then reattach. This leads me to believe that the adhesive could still be strong even after all these years. 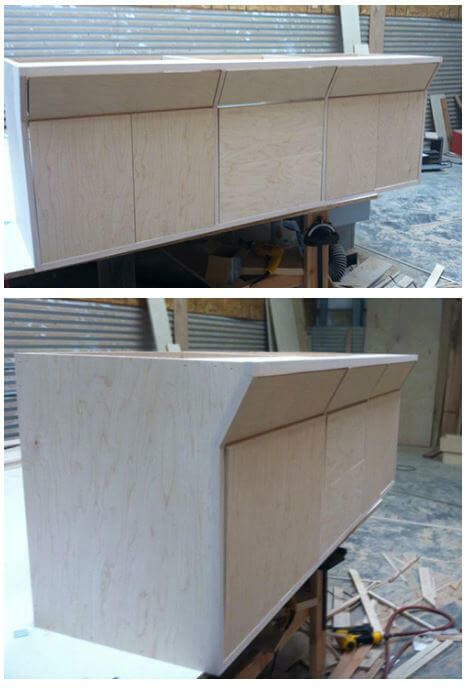 It’s sort of unusual, we think to see a sink skirt that attached on the outside. We think it’s more typical to attach the skirt from under the sink apron — like Laura did in her charming kitchen renovation. 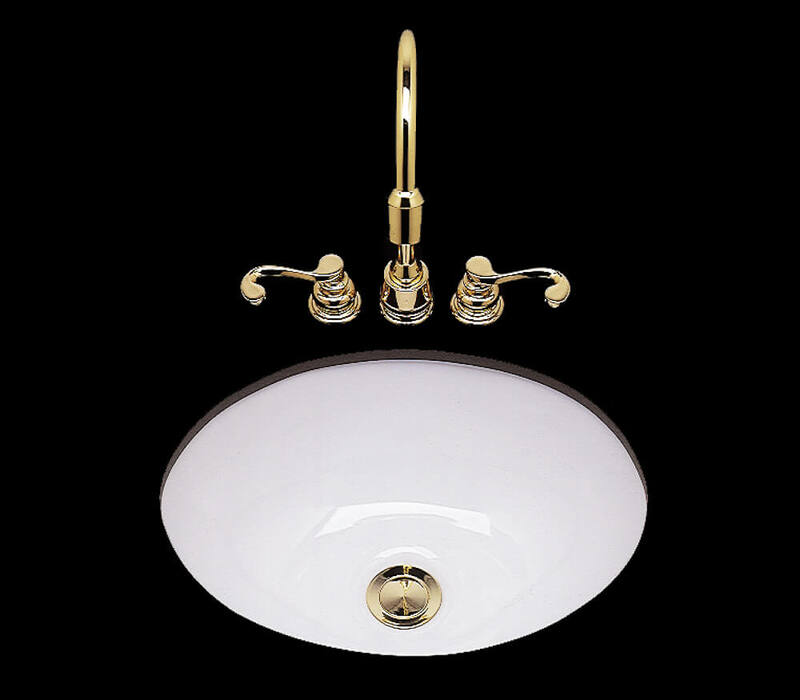 Would we use a sink skirt on a wall hung sink like this? Maybe! Just stay on top of the hairballs underneath! I made a sink skirt for the wall-hung sink at our old house. 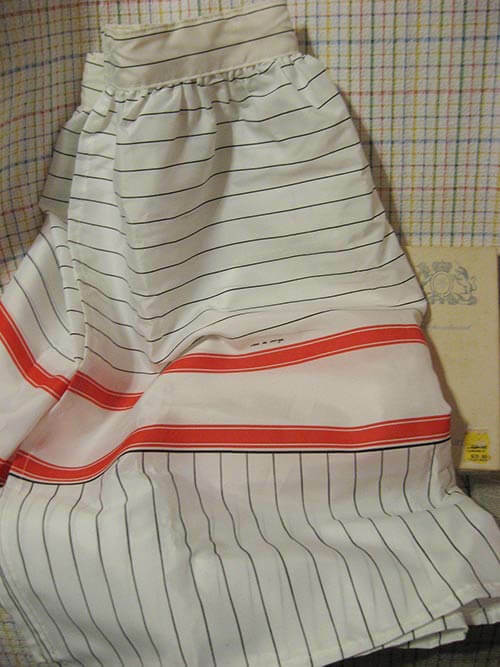 It was my own design — I didn’t want ruffles, so I sewed a lined panel each for the front, left and right sides. Nothing fancy, just my chosen fabric sewn to some white liner pillowcase-style. 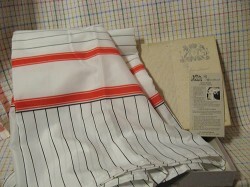 Then I cut and hemmed a mini panel to fit in each corner and bound it all together around the top with a 2″ “waistband.” I put it on the sink with velcro as someone described above. Had to buy two sets of velcro because I could not sew the sticky kind — the needle got icky. 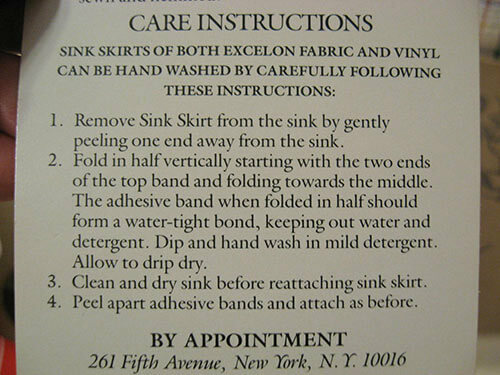 So self-stick on the sink, regular on the skirt. I made one for my 1945 powder room that attached on the outside, just like Lisa’s, with 2 kinds of velcro. If you have a good sewing or upholstery shop nearby, usually you can buy single sections of Velcro – sticky back male (hook) side, and sew-on femail (loop) side, instead of buying both. I made mine gathered, with piping b/w the top band and skirt, but I have also made a tailored version with 3 flat panels, overlapped at ther corners of the sink. It’s a great place to hide a litter box, and the cat can just step b/w the panels. My MIL’s tiny laundry/powder room is right off the main living area, and has a wall-hung sink directly in front of the door, so it’s always worn a skirt since they put it in.We experimented with a lot of ways of attaching it when she wanted to replace the skirt and attach it from the inside instead of the outside. Velcro finally won out. If you’re attaching on the outside, I tend to favor elastic stretched from hooks on either side of the sink on the wall. 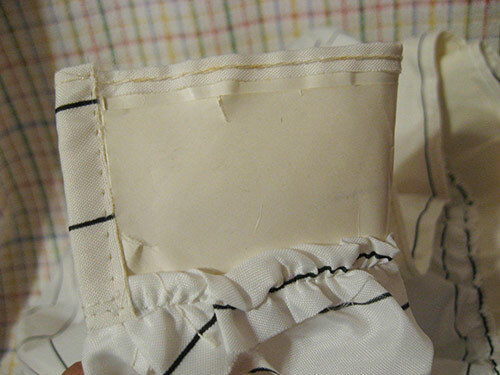 You can make a casing to run the elastic through, or just fold the material over it. Pam, I adore your website. Over the last 4 years I have researched it extensively to put my gramma (built in 1942) house back to it’s original state. 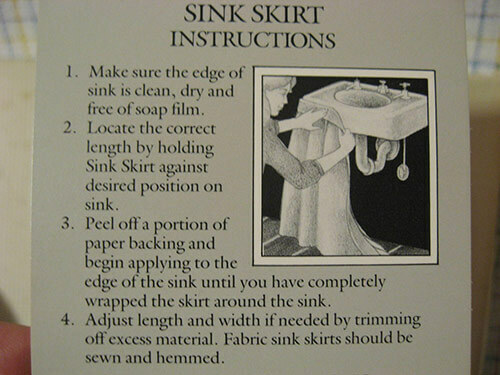 I just want to put out there that those of us with very small spaces, sink skirts don’t work. 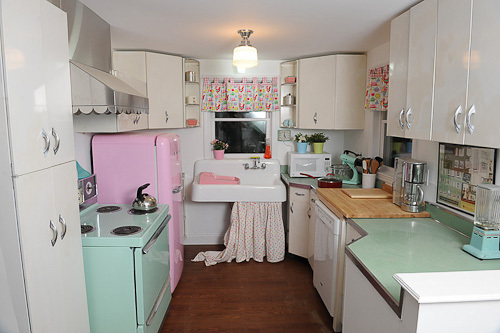 I love the look of them but they are the opposite of what is suggested to visually open up an already small space. 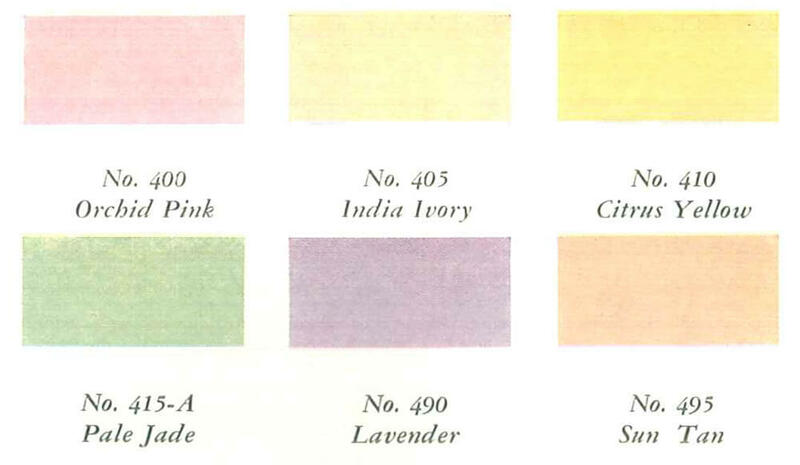 Could we raise the eye and see some 1940’s window treatments?